Want the same great success as Dr. Gilbert? Every industry evolves and changes, and dentistry is no exception. Over the last several years, I’ve seen more practices get buried than I’d care to admit. Most of them coming to me asking for help, but it was just too late. Whether getting steamrolled by corporate behemoths or blindly relying on outmoded and obsolete business strategies, like “word of mouth” only marketing, especially when younger millennial dentists are investing heavily in Google, paid online ads, the internet and cutting edge technology. Meanwhile, the “old guard” continues to just drag on with the same ol’ dusty new patient strategies. “What used to work will keep me successful forever”. The undeniable truth is that our industry has changed, and does so every day. Doctors who have “old world” thinking are getting squeezed out daily (along with their beloved staff) and wind up closing their doors or selling their practice for WAY under market value just to stop the bleeding. This is proven by the fact that the Journal of the American Dental Association (JADA) has reported that fewer dentists own practices now than a decade ago. If you’re a regular reader of this blog, you know that I never leave you hanging. In fact, I don’t like to waste your or my time talking about failure. Instead, let’s talk about how to avoid it. Learn how independent and solo dentist practices have figured out how to crush their competition and make their practice BULLETPROOF in this new economy, especially when it comes to attracting the younger breed of quality patients called Millenials! Even better, I want one of your peers to explain why taking action TODAY (not next year!) is imperative to the strength, health and longevity of you practice. You competition is reading this, and already has a full game plan for January 1st, when the clock strikes midnight. The bigger overall lesson here is “inaction and indecision”. Remember more harm is done by indecision than bad decision. Dr. Brian Gilbert’s Practice Just Had His Best Month Ever! I discovered Local Search For Dentists® through a flyer that was attached to a magazine that I got…I think Dental Economics or one of those magazines. That my first encounter with them was related to their offer to help me get more reviews on Google. And needless to say, that’s been extremely successful for us. We get reviews constantly. 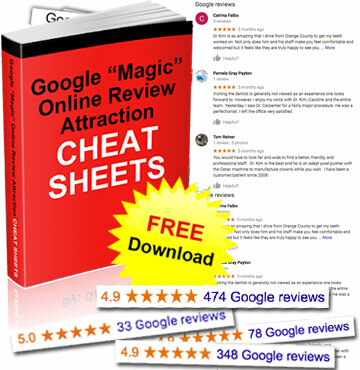 I believe we had 50 or 60 reviews when we started, and we have over 400-450 reviews now. That’s the number one-way people search for us — Google. So, to me it really paves the way for people to come in. It’s an endorsement of us from our own patients. And I think people see it as almost a referral from a friend. So, it’s been wonderful for us — very useful. I like working with Local Search For Dentists® because I don’t have to constantly be preoccupied; worrying about where I am on the Internet or if things are working on my behalf. They constantly work for me and they’re always checking to see my position, tweaking, keywords and more; details that allow my site and my presence to move up on the Internet. My experience with them has been really moving up from the bottom of Page One (if I was on it at all) to being on Page One with every search – really to the top of it. We’re in first and second place most of the time. And it shows — we get more and more calls. This August for example, was the busiest month I’ve had. In August, in the last three years as far as productivity collections, referrals and new patients, and we had a great number of those came from the Internet. Local Search For Dentists® has really helped us with our new patients, new patient numbers, just a volume of new patients because they have really moved us up on the Internet. And in our local area we don’t have a huge town – it’s a population of about 100,000 people, but the competition is very stiff. In recent years, we’ve had a lot of new dentists move in. Some of them are younger and are savvy regarding technology particularly Internet and social media. And so, we certainly felt the pressure from that to be competitive. And Local Search For Dentists® has really put us in a competitive place. I feel like we have a good reputation. Certainly, our numbers as far as the new patients that call us show that — we can look back because we track them carefully. And the numbers certainly show that work they’ve done for us has made a dramatic difference. LSFD is constantly looking at what Google is requiring, and they are responding. So, to me, having someone do that is great so I can focus on my patients and other aspects of my business; that’s a wonderful thing. I feel very relaxed and comfortable and confident that they are doing what I need them to do. The expression goes ‘a man doesn’t know what he has until he loses it’. I took a step away from Local Search For Dentists® for a period of time, and worked with a different company. I utilized the new company for a short period of time; less than a year. What I saw was the opposite of what I had experienced with Local Search For Dentists®. I felt that they didn’t seem to have a grasp of the demands of Google and the rules and reg’s, and the things that the Google likes and dislikes. As a result, I think they made some errors in that area, and that actually brought me down on the Internet. I moved down the [Google] page. We noticed a decrease in contacts from the Internet and decrease in new patient calls. When it got to its worst point…we had some “very slow days” into office. We realized there were issues and made a decision. I came crawling back to Local Search For Dentists®, begging to take me back, and they were very gracious. And they were glad to work with me again. After less than a month, our numbers really soared and we had a wonderful August; the best August we’ve had in probably three years as far as new patient numbers, referrals collections and production. So, it certainly was a sign that I think, we made the right choice to move back to Local Search For Dentists®. They have never let me down in the past and they are not letting me down now. First of all, we knew we’d made the right decision to return. Secondly, the reality is the buck stops with me…and all the bucks come from me. So, I pay all the bills and we have to keep the business afloat. And we got to take care of our team members, my family, their families. I feel like really, I’m responsible to take care of all those people. And so when we started working with LSFD again, I felt like a sense of relief, a sense of happiness that I could do that, and feel comfortable, confident that that will be achieved. You know, whenever I’ve tried to contact Local Search For Dentists®, it’s been great. First of all, they’re immediately responsive, either via email or by phone. Derek has been helpful. John, Jennifer and everybody that I’ve worked with; they’re right on it. They get back to me quickly. I’m a busy man, I always have something to do and they’re right on it. I feel comfortable. I always feel confident that they’re gonna be back with me and give me the answers I need. When I’ve been concerned about this or that, in 24 hours they’ve taken care of it or they’re focused on it, no matter what it is. So, they’re very responsive. The gifts and abilities of the people at Local Search For Dentists® are invaluable to my practice. They have helped us to really win in our market because they know so many sophisticated, esoteric details of the Internet and how to reach people through that. I think that working with Local Search For Dentists® has given my whole team a different level of confidence. When you start to see, for example, the multiple reviews that we get and hear the positive words. And then, you’ve started seeing your patients coming in from patient referrals related to that and just a better position on the Internet…it makes a difference. Local Search For Dentists® has made my job more enjoyable. It has removed stress from me. They’ve helped me sleep at night. They’ve helped my income go up. And they’ve given confidence to me and my team members. I can’t say enough about how much I appreciate them. Category Business Building, Corporate Dentistry, General Business, Local Search Tips, Marketing & Growth, More Google Reviews, Practice Management | Bookmark the permalink. ← Welcome to LocalSearchForDentists.com Internet Dental Marketing Website!